Naima Rauam specializes in watercolors of New York City. Her studio is at the South Street Seaport in Lower Manhattan. Rauam's paintings are in private, corporate and public collections, including the Smithsonian Institution, National Air & Space Museum, American Merchant Marine Museum, Farnsworth Museum, Pfizer, and the Bank of America. She has exhibited in solo and group shows in the United States and abroad. She also lectures, teaches, and curates art exhibits. 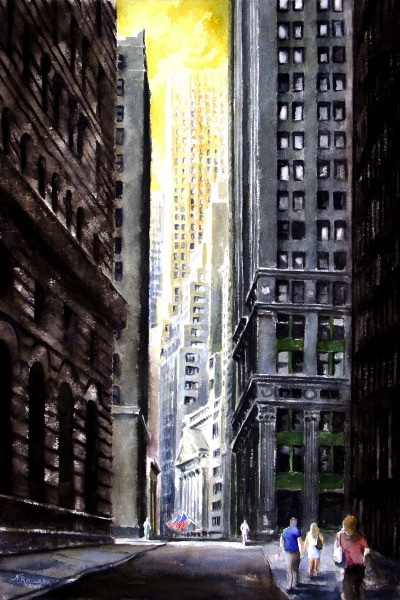 Her work is in Secrets of New York City, published in 2002, and has been featured in the media, including The New York Times, The New Yorker, Art in America, Watercolor Magazine, New American Paintings, "Going Places: New York City" (PBS-TV), "New York Voices: On the Waterfront" (PBS-TV), Aquent Online Magazine, "John Montone's New York" (1010WINS Radio), and "On the Road with Charles Kuralt." Naima's website is artpm.com.